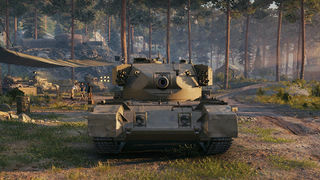 The FV4202 is a British tier 8 premium medium tank. Experimental vehicle on the basis of the Centurion medium tank. Developed from 1956 through 1959. Never entered mass production. 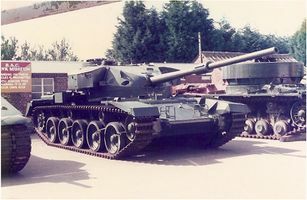 Technical innovations used in the FV4202 were later reapplied to the FV4201 Chieftain. 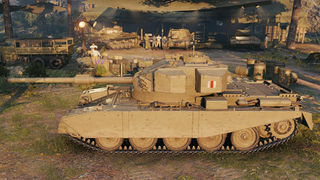 Prior to the patch 9.12 the FV4202 was a British tier X medium tank, and then has been removed from tier X to become a tier VIII premium tank, while its tier X medium place has been filled by the Centurion Action X. The FV4202 is great as a second line sniper, with its high penetration and great accuracy. You can peak over ridges with its great gun depression and often come out better. If you are using the tank's gun depression and only exposing the turret, incoming shots may occasionally ricochet off the forehead due to the steep angle of engagement. It plays like the Centurion Mk. I but with some differences. The "cheeks" on the turret will be your downside if you stay still as they are only 85 mm thick and not well sloped. Constantly move back and forth over the ridge to prevent your "cheeks" to be exposed for too long and if the enemy miss or hit the upper turret plate you can punish. Always try to battle in hilly terrain; never flat as your armor won't protect you. Very often and you will receive damage if any gun is pointed towards you if on level ground. With patch 9.17, it gave the FV4202 an acceptable speed buff of 40 km/h and profitability, and 9.17.1 gave it a good speed of 50 km/h. Unlike the Centurion Mk. I; which has a stronger engine and hp/t of 16.81 (Fully upgrade, no equipment), the hp/t for the FV4202 is 12.34, basically means the FV has a while to reach its top speed, and struggles a bit climbing up hills, like Westfield. However the FV4202 has the best ground resistances of any Tier VIII mediums (.38/.48/.96) followed close by the Panzer 58 Mutz and T-44-100 (R), so while it has a weak engine it has good acceleration and swamp terrain won't affect you as much. So if you managed to find a good spot where you can set up and snipe enemies from afar with your accurate gun, you can make a profit. Always support your team in either Wolf packs or Heavy pushes, aim for the weak spots and drive wheels, it will print credits. 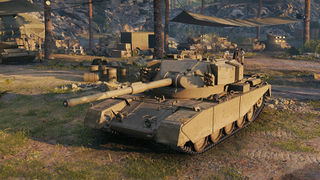 Overall the FV4202 is good crew trainer tank for the Centurions from Tier VIII to Tier X and can be rewarding experience if you keep in mind your weaknesses and strengths. After the release of Centurion 5/1 and other tier 8 premium tanks, the FV4202 is in desperate need of a buff. No researched required as it is a premium tank. 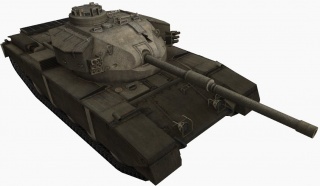 Towards the mid-1950s, tank designers saw that the current generation of tanks is at an end. Something new and revolutionary had to be done. The 1950s, specifically the latter half, became a time of new creative ideas in the tank design world. The birthplace of tanks was no exception. The Centurion, the peak of the achievements of British engineers during WWII, was nearing its decline. Three roads were open: one was the creation of a while new tank, another was a deep modernization, the third was an evolutionary step. The third path was seen as the least promising, but it was the one that was chosen. The 105 mm L7 gun's appearance extended the Centurion's life for decades. Even the prototype built in 1945 was still serving somewhere. The result of this modernization was the Centurion Action X that appeared in 1955. 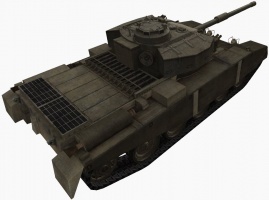 The Centurion Mk.7 hull was equipped with a new turret, but the project did not progress past experiments. As for the creation of a new tank, the first step in this direction was taken in 1956. A tank nicknamed "40 ton Centurion" entered trials. This was an unofficial nickname, of course, the tank's real index was FV4202. Compared with the competitor Medium Gun Tank FV4201, it seemed like a step back. The "predecessor" had an IS-3-like pike with a central position for the driver, and a whole new turret. The FV4202, the vehicle chosen to be built in metal, was a much more conservative evolution of the ideas in the Centurion and Centurion Action X. The hull was a development of the Centurion, but ended up somewhat lower. 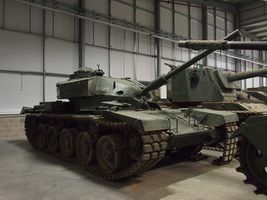 Thanks to this, the overall height of the FV4202 was 2.75 meters, a whole quarter of a meter less than the Centurion. The lower hull was used to increase the slant of the upper front plate. The hull was also half a meter shorter, reducing the amount of road wheels to five per side. Thanks to these operations, the mass of the tank decreased from 51 to 40 tons. The turret was a development of the Action X. The front resembled its predecessor, but had some novelties, like the "beard" underneath the gun mount. The roof also had many common elements. The rear was noticeably different. A late model 20-pounder gun was used. By this time, it got rid of the massive muzzle brake and obtained a fume extractor. Externally, this gun looks similar to the 105 mm L7, which leads to confusion. Three FV4202s were built. Trials continued for several years, but the tank wasn't given a chance. 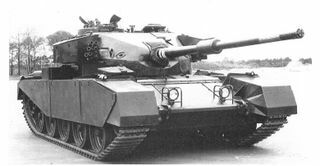 The evolutionary development of the Centurion was declined and, instead, the FV4201 concept was developed further. 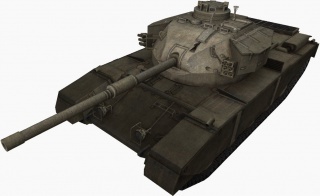 By September of 1959, the P1 prototype entered trials, leading to the Chieftain tank family. One of the FV4202 prototypes was sent to the scrapyard. Another was converted to an ARV, which can be seen in the REME Museum of Technology. The third vehicle ended up in Bovington. Time and a harsh climate did their thing, and the vehicle currently requires a very thorough restoration. Several years ago, the Vehicle Conservation Center was built, which now houses several vehicles that used to be outside, including the FV4202. There is hope that, someday, skilled hands will find their way to this tank, which was a significant, if not well known, point in tank development. Who knows that British tanks would look like if the British would adopt a vehicle that was much smaller than the Centurion, yet equal in protection and firepower. The tank did not survive to this day in a good shape. The armour skirts, similar to those on the Centurion, are gone, as are much of the fenders. 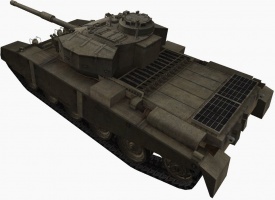 Instead of its own tracks, the tank wears those from late Centurion models. A lot of the stowed equipment is gone, including the headlights and tools. Nevertheless, this is much better than a scrapped tank, but the restoration crews have their work cut out for them. Despite many similarities, the FV4202's hull differs from that of the Centurion. Most notably, the hull is lower to the ground, allowing the front armour to be placed at a sharper angle. With the same armour thickness, the tank is much better protected than the Centurion, although 80 mm of armour in the late 1950s was not enough, even with this slope. Like the Centurion, the FV4202's driver is positioned to the right of the tank's axis. The reduction in size did not do wonders for the comfort level, but recall that the Chieftain's driver is practically lying down. Here, the workspace is still more or less acceptable. Unlike the Centurion's two piece hatch, the FV4202's driver hatch lifts and rotates to the side. This is a much more convenient solution. The suspension migrated from the Centurion Mk.5 with nearly no changes. Of course, "nearly" has a number of nuances. First, the amount of road wheels was reduced to 5. Second, the width of the track links decreased. The tank lost its original tracks, so the second difference is currently gone. The FV4202 used Horstmann's suspension, which, in various forms, was used on British tanks since 1922. This design was last used on the Chieftain. Despite this rather conservative design, this suspension was satisfactory. However, the issue of removing the bogey in combat conditions was a difficult one. The rear is similar to the Centurion. Nothing is revolutionary here, just a standard vertical plate. To the left, one can see a field telephone that has been ravaged by vandals, a typical feature on post-war British tanks. The engine compartment roof is also similar to the Centurion's. One of its features is a multi-part design. This is a very convenient system, even a person without great physical strength can open up the engine compartment on their own. The Americans used a similar system on the Pershing and the Patton, and the Swiss used it on the Panzer 61. The bottom of British tanks is the pinnacle of minimalism. No hatches here, only a few service openings. If the tank was knocked out, the crew would have to leave under enemy fire. The turret of the FV4202 has much in common with the Centurion Action X, especially the front. However, there are a series of differences. For example, a "beard" under the gun mantlet, protecting the turret from jamming. The main armament of the FV4202 is a late model 20-pounder gun. It lacks a muzzle brake, but has a fume extractor to extract gases after firing a shell. From far away, this gun looks like the L7, but close up one can see that the fume extractor shape is different. This page was last modified on 3 April 2019, at 21:15. This page has been accessed 101,705 times.